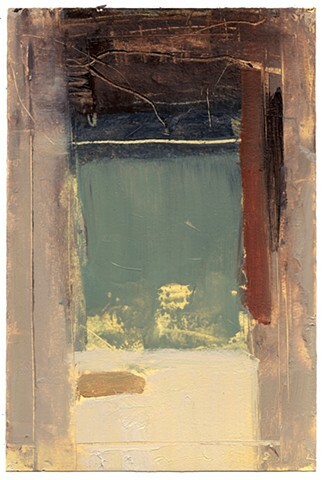 The show will include work by artists born in 1959, including Markus Baenziger, Sharon Butler, Elisabeth Condon, Dionisio Cortes, Catherine Howe, Dion Kliner, Robert Lansden, Xanda McCagg, Joseph Salerno, Mary Schiliro, and Amy Yoes. On Saturday from 4-7 pm, there will be a little reception with a big disgusting birthday sheet cake, because, you know, 60. 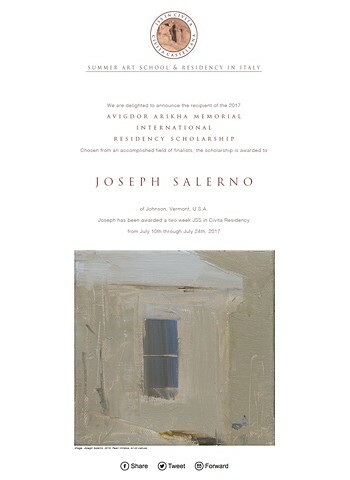 Joseph Salerno records the passage of time with a palpable devotion. 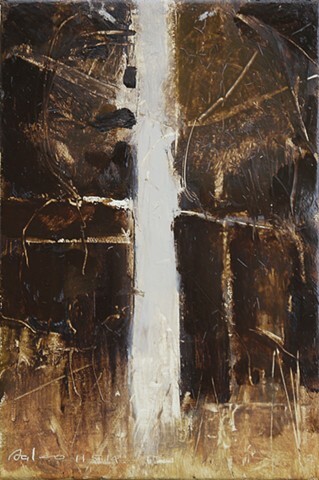 His multiple series of paintings are entitled “Woods Edge”; they depict seasonal and diurnal changes at the margin of the woods in an often haunting manner. The four pieces shown here are a tiny selection from hundreds that Salerno has painted over the years of the woods near his Johnson, VT home. The oil studies are most powerful when seen together as they form an ongoing meditation on the shifting character of familiar woodlands. 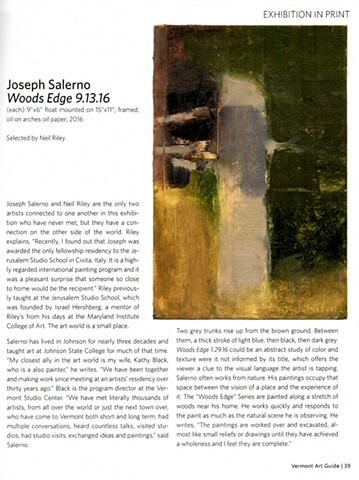 Salerno’s work is a record of his experience outdoors and his commitment to direct observation. But his work is the antithesis of illustration. It is not showing us what the woods look like- but rather what the woods feel like in the time space continuum. 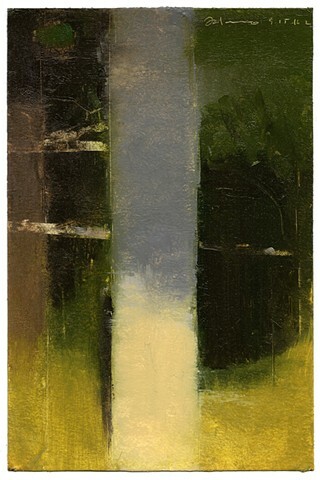 How do these small paintings transmit the silence and gravity of the forest so well? One gets the feeling from each piece that the day is in the process of getting darker or lighter, and that every moment is dramatically different than the next. 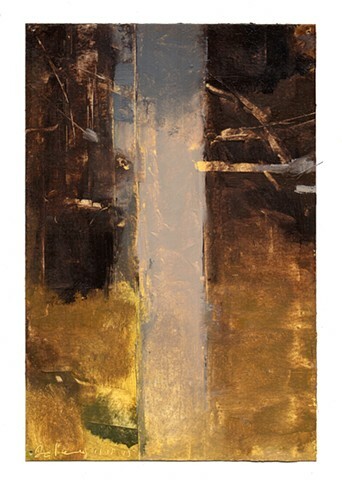 Compositionally, the majority of paintings in the “Woods Edge” series have two foreground tree trunks. 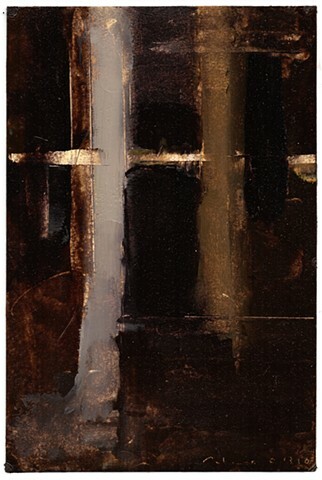 These strong vertical elements form a doorway- a liminal passage- to the dark forest beyond. At times the invitation to pass through the portal is inviting, and at other times- a dare. 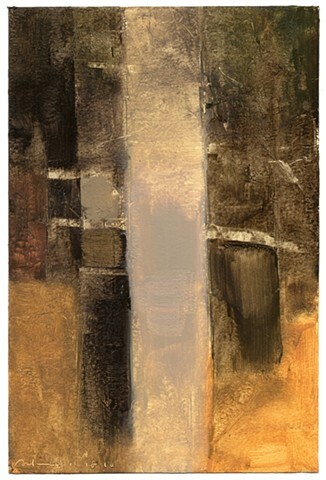 The opposites of light and dark, abstraction and realism, foreground and background are provocative. 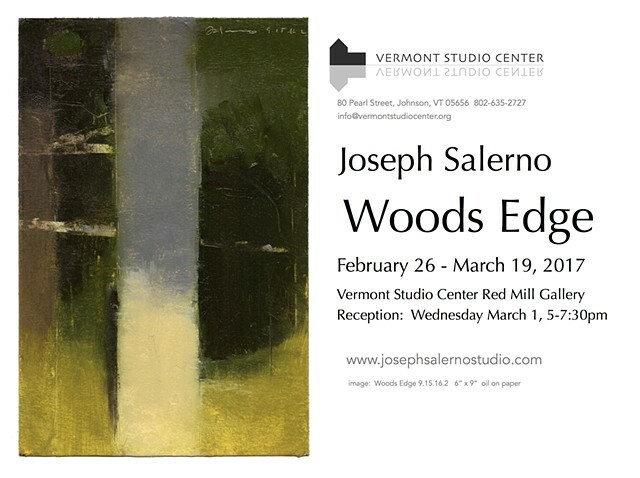 Joseph Salerno works out of his studio in Johnson Vermont and is on the Arts faculty at Northern Vermont University. An exhibition of his work will be at Alex’s Gallery, in Waterbury VT from February 26-April 11,2019. He is represented by Furchgott-Sourdiffe Gallery in Shelburne, VT, Mitchell Giddings Fine Arts in Brattleboro, VT and the Ober Gallery in Kent CT. 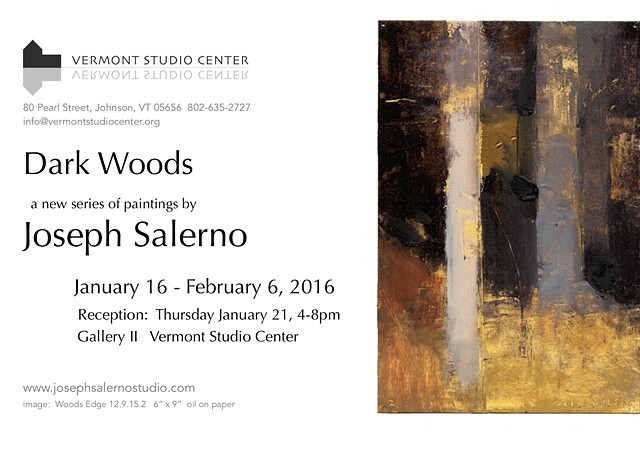 Please join us for the opening reception of new paintings by Johnson, Vermont based artist Joseph Salerno. FOREST RECOLLECTION, a group of fifty paintings created over the past three years, allow a viewer to behold a subtle yet profound rumination on landscape and how the act of looking and creation weave and bob over time. 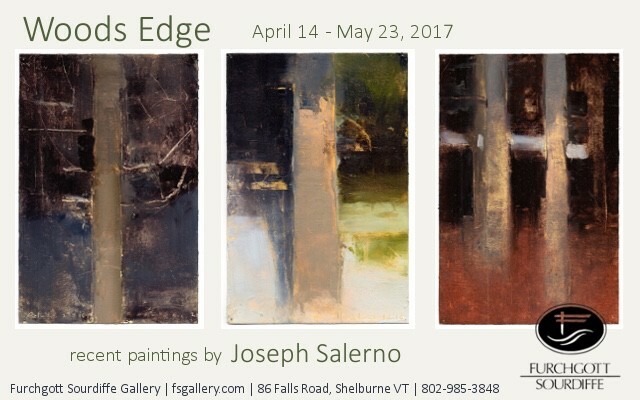 Haunting, resonant Vermont forests, drenched in mist or glowing with ethereal light, wind an elegant trail through the gallery. 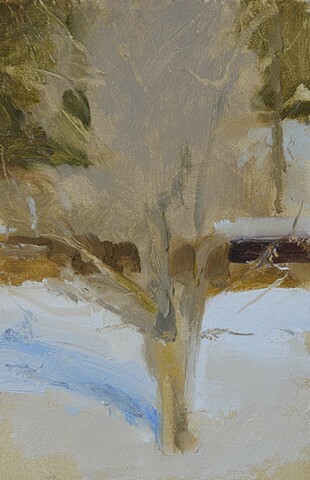 Each piece adds a soft, unique voice to the observation of natural landscape, allowing a viewer to pull close to intricate details in an individual work while also regarding the series from a wider lens, absorbing landscape as a growing collection of facets and subtleties. FOREST RECOLLECTION is an exhibition that wanders into memory with paint used as both a cloak and a window. Moving through these works calls to painting's ability to live on the edges of abstraction and representation, like watching a film set to slow motion or paused for a moment in soft focus. The resounding feeling is one of landscape as a place that relates to the outside world yet also exists in the depths of our most essential thoughts. 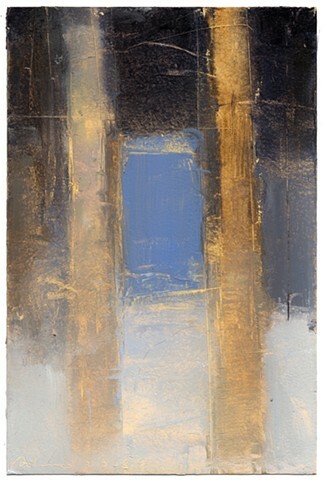 Landscape painting becomes recalled space, a bridge between its place in the world and the place it lives in our minds. A reception for FOREST RECOLLECTION will be held Saturday, September 15 from 3pm-6pm with an artist talk at 4pm. 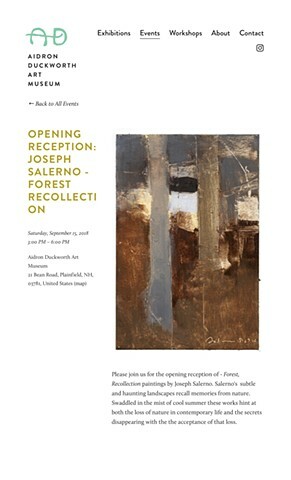 The exhibition will be on view through October 28. Woods Edge 10.13.16 has been selected by juror Kyle Staver for exhibition in the 2017 Bowery Gallery National Competition. The Opening Reception will be Saturday, July 15, 2017 from 3 - 6pm. The exhibition runs from Tuesday, July 11 through July 29. On Friday, July 14 at 6 pm, Stuart Shils will be giving a gallery talk. There will be an Artist Talk and Reception on Thursday, May 11 at 4:30pm. Celebrate the beauty of the Vermont landscape through a collection of work that reinterprets our connection with place over time. By using a particular place as inspiration each artist is unveiling nature's ever changing beauty through the focused and repetitive study. Through this exploration we can witness the changing landscape and the artist’s changing point of view. Featuring work by Karen Henderson, Jill Madden, Joe Salerno, and Gowri Savoor. “When Things Fall Apart, the book by spiritual teacher Pema Chodron reflects the moment when a turning point, crisis, or challenge opens a person to a new way of thinking. A moment when we stop seeing things for what we think they are and starts seeing them slower, as they unfold in the present moment without judgment as they are.